The Tresco collection by Neptune comes in a range of styles and sizes and includes modular options, allowing you to make the perfect arrangement for the space you have. These woven resin designs are based on the styles of traditional upholstered sofas, and can be cleaned easily with your garden hose. The sofa is quite low and isn't too deep, ensuring optimal comfort at all times. John Lewis' Cabana 2-Seater Sofa is perfect for those evenings when you want to curl up with friends and enjoy a nice summer cocktail. The unique design will make it a beautiful edition to your outdoor area, especially in those smaller spots where space is at a premium. The sofa is UV-protected so it won't fade in direct sunlight, while the pod cocoons you in the seat, creating a sense of comfort and intimacy for your summer soirees. If you just want a space to sit and have a casual coffee and chat with a friend, then this bistro set from Asda is perfect. 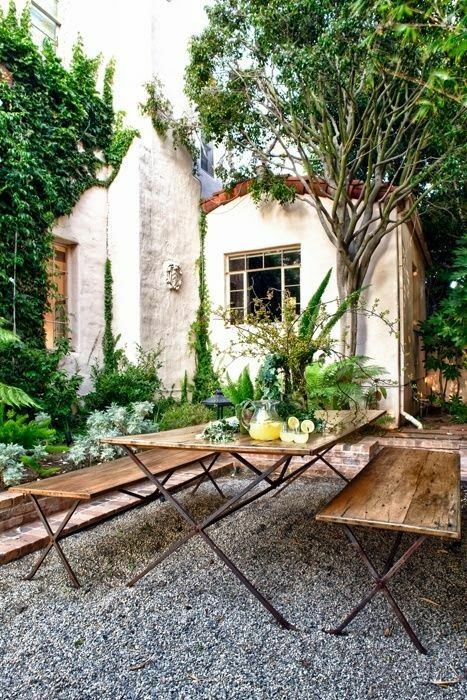 The glass tabletop and comfortable chairs are a great way to create a relaxing summer space. At just £249 for the whole set this is an inexpensive way to create an outdoor seating area in any space - this is ideal for balconies and terraces where space can be limited. If you're looking for ultimate relaxation then this beautiful hammock by Amazonas is a wonderful addition to your garden. Spend your summer days lounging with your loved ones or a good book. Keep it as a permanent feature in your garden or take it with you on trips with your friends. Best of all, not only will it create a wonderful aesthetic, but when the winter months come around it can easily be packed away without fear of it being ruined. This solid oak Brunel Table and matching benches from Indigo Furniture will give your al fresco dining experiences an industrial edge. Unlike the traditional wicker tables and chairs, the Brunel's steel legs and UV-oiled wood make for a robust surface that can face the outdoor elements with ease! The table is available in three different lengths (ranging from 183-244cm) and pairing it with the benches (also available in three sizes) will give your whole family enough space to dine outside all summer long. Habitat's iconic Jambi collection is back, but this year it’s in a range of bright new colours. The tones are bold but won't overpower your outdoor design due to the intricate woven pattern that creates natural negative space. This collection comes in a variety of colours and styles, including a lounger and bench - the collection sold out in just 2 weeks last year, so be quick to grab yours. 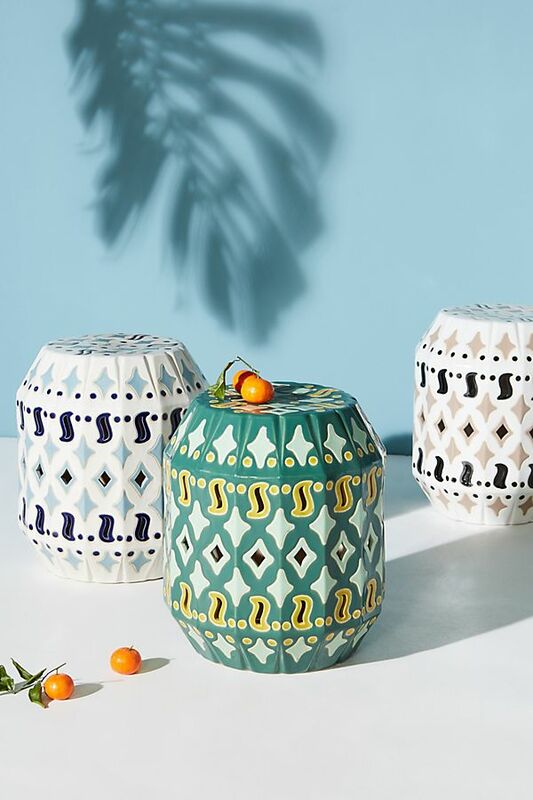 Inspired by the ornate fretwork designs of Marrakesh, Morocco this ceramic side table will add a pop of colour to any outdoor seating arrangement. 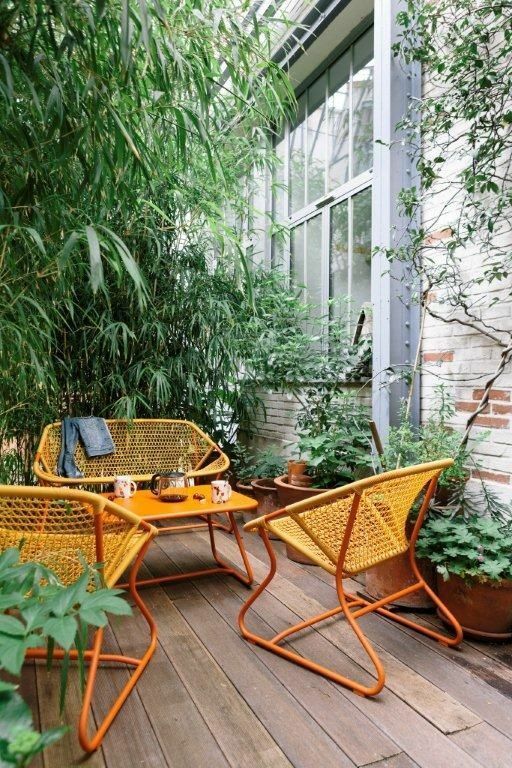 Pieces such as this are a great way to incorporate the colours trend into your outdoor space without having to replace your existing furniture. As this table is intended for indoor and outdoor use it can be brought inside and used during the winter to both brighten up your space and prevent the ceramic from cracking in the cold. 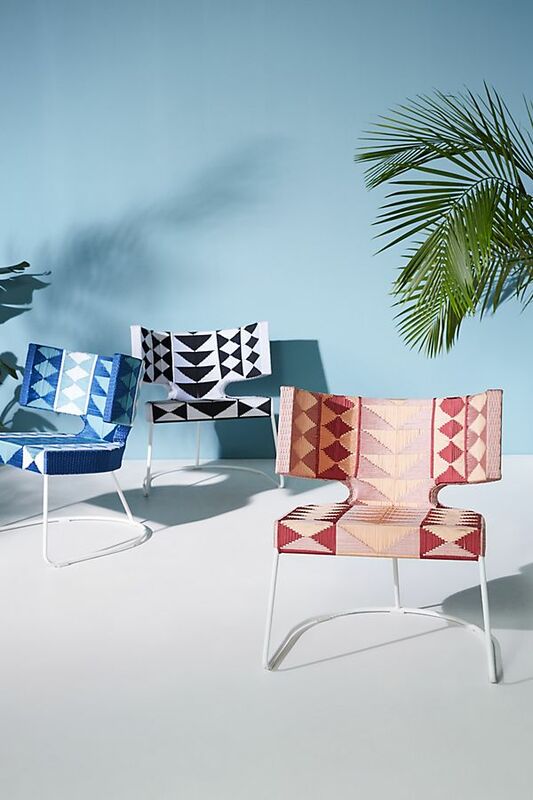 If, like us, you aren't ready to leave behind pastels or have been hooked on the Mexican trend, then Anthropologie's new garden furniture range will fulfil all of your style needs. Both ranges - Ancer (Left) & Cabo (Right) - incorporate this summer's trend of bright colours in a different way, making them perfect for anyone who isn't a huge fan of bright pinks and greens. If you are ready to fully embrace the bright and bold colourful trend, then the Copa range from Made.com has loads of unique options for you to choose from. The 3-piece set will liven up any small space; the citrusy, graphical colours and patterns allow you to make a bold statement that reflects your individuality.